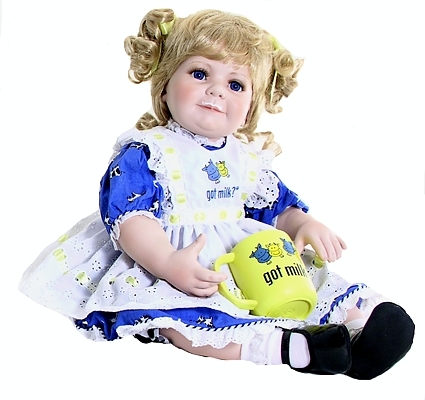 Marie Osmond Dolls - Got Milk - Porcelain - by Matilda Dolls! Doll Description: Dressed in a crisp white eyelet pinafore apron with cow trim, and a blue dairy-themed dress with yellow ribbon accents, �got milk?�� embodies the goodness and freshness of nature�s drink�milk. Original head, arms, and legs by sculptor, Jo Ann Pohlman. �got milk?�� is hallmarked on the back of her neck with Marie�s signature and is hand numbered.No box.